One morning several weeks ago, I received a mysterious package in the mail. Inside was The Book of Forgiving, a handbook on the why and how of forgiveness written by peace activist Desmond Tutu and his daughter Mpho. With no note that identified the sender, the package felt like a gift sent from beyond—it inspired me reflect on the tremendous role forgiveness plays in recovering from an eating disorder. When I was immersed in my eating disorder, I experienced many forms of resentment. Sometimes I felt victimized by the behaviors that prevented me from engaging in life fully. Other times I felt frustration with the ruminative, obsessive, and vicious thoughts that muddled my mind and made it so hard to concentrate. Often I felt anger towards my mother, father, friends, romantic partners, medical providers, teachers—anyone who enabled or triggered my ED. As I gradually climbed out of the trenches of the disorder, I realized it was essential to let go of these resentments, angers, and hurts. In order to truly move on, I would need to forgive the traumas, biology, and environment that lay the groundwork of my disorder. I would need to forgive the people around me who perpetuated my disorder. I would need to forgive the nature of the disorder itself—the obsessions, compulsions, and other destructive repercussions I had endured for so many years. And most of all, I would need to forgive myself. In his book, Tutu notes how as human beings we are all inherently flawed. We make mistakes. We do harm, and we are harmed. But we all deserve to be forgiven, because we all deserve to return to the peace that is our natural state. In my own recovery, it began by looking honestly at my story and disclosing the facts of my experiences with others, through both writing and speaking. Then I attached feelings to the facts: I shared my raw and painful experiences of anger, grief, loneliness, panic, unworthiness, and shame. Next—and this is often the hardest part for me—I granted myself forgiveness by letting go of the guilt story and the victim story, and chose to adopt the story that I am a flawed but resilient and courageous human doing the best I can by choosing recovery. This led to the renewal of my relationship with myself: I committed to being my own best friend and greatest ally, and putting an end to the war with myself that I had endured in my eating disorder. I have had to repeat this practice of self-forgiveness many times, for while it is a simple process of just four steps, it is far from an easy one. Tutu encourages us to “choose forgiveness over and over again, and cultivate it as a quality of our character.” The more I engage in forgiveness—over small daily pains to large-scale life sufferings—the more instinctual it becomes. If you want to explore practicing forgiveness in your own life, these resources can help you get started. 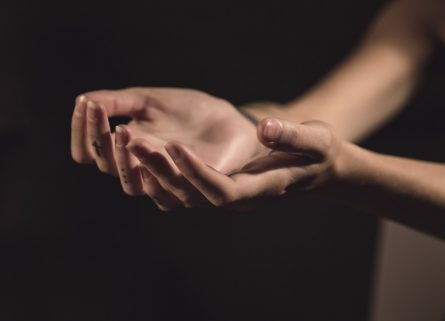 Participate in the Forgiveness Challenge, a virtual global mission initiated by Desmond and Mpho Tutu that walks you through the four steps of Fourfold Path. Get inspired by the real stories of extraordinary acts of forgiveness collected by The Forgiveness Project. Use The Book of Forgiving as a handbook: it includes meditations, rituals, and journal exercises at the end of each chapter.